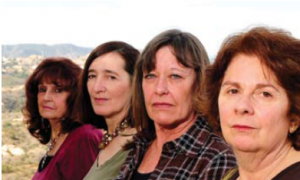 Barbara Johnson, Dawn Kawolski, Holly Huff, and Marie Mason are co-founders of the Rocketdyne Cleanup Coalition. Click above photo to read A Loss of Innocence, a story of their struggles and dedication. Photo by David Michel Lincoln. 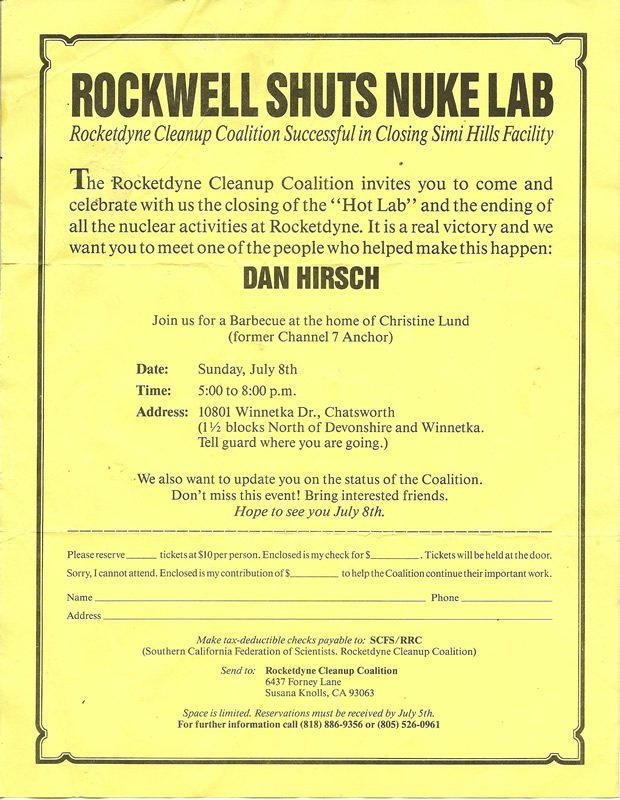 The Rocketdyne Cleanup Coalition, or RCC, is a community-based alliance dedicated to the now State of California-mandated cleanup of the Santa Susana Field Laboratory (SSFL), commonly known as Rocketdyne. We do not accept polluter money for our efforts. 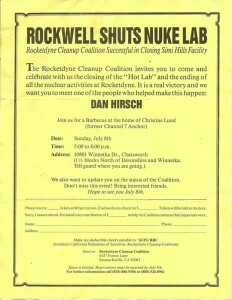 RCC was formed in the summer of 1989 to prevent the re-licensing of nuclear work at Rocketdyne, Area IV. Our founding members included Holly Huff, Dawn Kawolski, Barbara Johnson, Marie Mason, Don Wallace, Sylvia Fliss, Jerry and Bunny Raskin, George and Eleanor Rembaum, Millie and Sheldon Plotkin, Estelle and Mark Lit, Jon and Lorraine Scott, Jeanne and Sol Londe MD, Pauline and Richard Saxon MD of Physicians for Social Responsibility-LA and Dan Hirsch of Committee to Bridge the Gap. The DOE nuclear facilities were spread over 270 acres and included ten reactors and a plutonium fuel fabrication facility. Rocketdyne wanted to renew its license to continue nuclear work in Area IV. We believed that activity would bring additional harm to the health of our communities, and so together with other key people and organizations, we shut down the site, believed to be the first community-based shutdown of a DOE nuclear facility in the country. Since then, we have had many accomplishments working to protect the health and well being of the millions of people who live within the lab’s vicinity in Ventura and Los Angeles counties. One of the largest victories was helping to ensure the passage of SB 990, introduced by Senator Sheila Kuehl, co-authored by Assemblymember Julia Brownley, and enacted into law by Governor Arnold Schwarzenegger in 2007, which requires that the 2,850-acre lab is cleaned up to the highest standards. Unfortunately, these are standards currently being fought in court by The Boeing Company, which owns and operates part of the SSFL . We are working to prevent efforts by the “Responsible Parties” to walk away from the site without a comprehensive and complete cleanup. The Responsible Parties include Boeing, the Department of Energy (DOE), and NASA. DOE and NASA have recently agreed in principle to clean their parts of the property to background levels, and we are working to make sure they sign binding, enforceable agreements immediately. State Senator Sheila Kuehl met with community members and advocates regarding SB 990, which will ensure that SSFL is cleaned up to the highest possible standards. Going up against such powerful and well-funded entities is no easy task, but we draw strength and courage from one another and the knowledge that we are doing what is right for ourselves and our communities. We are inspired by the steadfast dedication of those who have being doing this work for decades, and we are heartened by the energy and creativity of those who have recently joined the effort, such as Teens for Toxins who in March, 2010 held a “tongue-in-cheek” bake sale to help Boeing pay for the cleanup, which Boeing had said it didn’t want to pay for. You can read more about co-founders Dawn Kowalski, Marie Mason, Holly Huff and Barbara Johnson in A Loss of Innocence and about our organizational allies here. Our website will feature profiles on other allied community members as well, beginning with a Community Spotlight on former Rocketdyne worker Bonnie Klea. 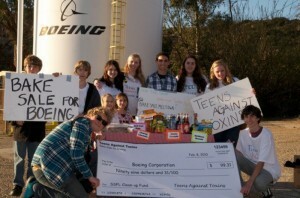 Teens Against Toxins held a bake sale for Boeing to help raise money for the SSFL cleanup in February 2010. The Rocketdyne Cleanup Coalition welcomes your interest and invites you to explore our new website. We hope you will find answers to many of the questions people have when they learn that the worst partial meltdown ever in the United States was up in the hills between the Simi and San Fernando valleys. Our website will have frequently updated news and notices. 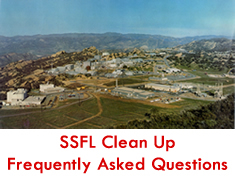 In addition, the agencies sponsor quarterly meetings of the Santa Susana Field Laboratory Work Group where the government briefs the Work Group and public on the latest developments on the cleanup of the lab. Come to these important meetings at the Simi Valley Cultural Arts Center. Please join us. We are living proof of what can be accomplished when community members come together and take a stand to protect the health of their loved ones and communities.